Yep, the soap with hemp seed oil is called "Toke." 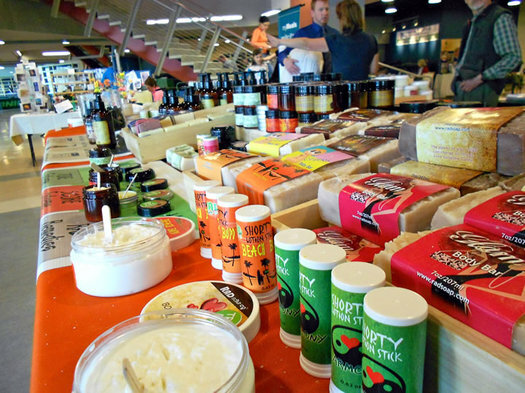 Sue Kerber thinks the Capital Region needs to use more soap. 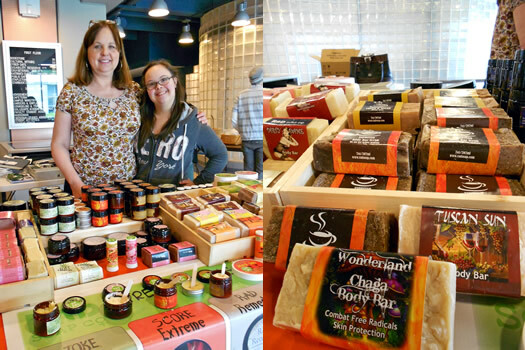 A familiar face and vendor at local farmers markets, Cohoes-based RAD Soap Co. has grown quickly in its four years. Sue's soaps and lotions began as a natural remedy to her family's ailments, from eczema to muscle pain to sinusitis. Those home remedies eventually turned into a full line of soaps, lotions, crÃ¨mes, balms and teas made from all natural ingredients -- and shipped all over the country. "I love it because I'm a mom to the world now," said Kerber. Another thing that motivates her: "a strange desire to rebel." Her products include natural essential oils, but they also feature unusual ingredients like Chaga mushroom, hemp seed oil, tea from Divinitea, wine, and espresso. Then they're packaged with some humor: the body bar with hemp oil is called "Toke," a hand scrub -- "ideal for gardeners" -- is called "Hoe Down," and the lip balms are called "Lip Service." She has her eyes set on beer and hops next. "We can do anything we want," Sue explained. RAD products on display at HVCC's Earth Day event. RAD tries to create products that both work and are a little untraditional. The inspiration for the funky, but functional, products comes from all over. Sue says she and her husband Gregory have consulted with doctors, geneticists, nutritionists, holistic healers and fellow vendors as they've developed products. But they also draw from their interactions with customers. Their Chaga line came from a customer's mention of the mushroom. And RAD's next project is a line using matcha green tea, which a another customer suggested. Sue and her daughter Alexis. So far, the only complaints the Kerbers have had are from their two Yorkshire terriers, overwhelmed by the aromas coming from the family's garage. So Sue hopes the next big step for RAD Soap is to move their cozy company from their Cohoes home to a "Willy Wonka of Soaps factory" where people can learn about natural resources and remedies, and have a little fun in the process. Until then, the family business will continue to tweak their products from home -- and have fun doing it. 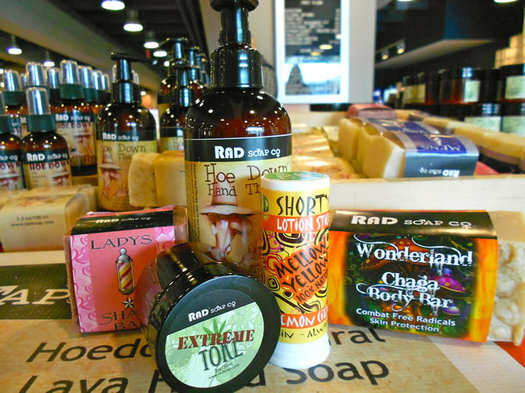 RAD Soap is available at the Schenectady Greenmarket and The Troy Farmers' Market, as well as online. + Earlier this year, Jess at Wanderlusted reviewed some RAD products. Thanks for the interesting article. Have never used soap containing hemp. Would like to give it a try. Love the name! RAD has a good thing going on. I'm obsessed with the Beach Bum bar soap! Im a BIG fan of Rad Soaps, I follow them around at the farmers markets! great products! Love ROAD Soap Company! I keep a healthy stock of their Beach Bum body cream (gives you that just-back-from-the-beach scent) at home and am known to replace my BF's soap bar with the Original Gangsta soap (masculine but still nice smelling). Sue's always a smiling face at the Troy Farmer's Market. I wish i could smell Evening in Paris soap. Was too young to get it in a Christmas stocking like my big sisters did. It's funny, we never thought we'd be using our own tea to clean ourselves, but Sue Kerber does such a great job with her soap. The scent is really special and it feels great on the skin! We're all happy over here at Divinitea to be featured in a really outstanding product. Congratulations!!!! Yous Calendula soap is soo goooood!!!!! I love it!!! I just visited the Stuyvesant plaza store for the first time! Great products....purchased the Dream cream to help with getting a good nights sleep. The staff was helpful and informative. Such a pleasant shopping experience.??????? ?